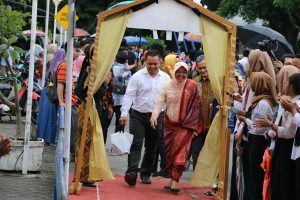 Sunday 11 March 2018, Mrs. Risma close as the mayor of Surabaya attended the graduation of her daughter Tantri Gunarni at Graha Sepuluh Nopember, Institut Technologi Sepuluh Nopember (ITS) Surabaya. Tantri is the youngest daughter of two siblings. 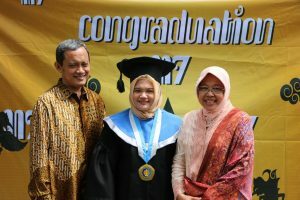 Previously Mrs. Risma’s first son, Fuad Bernardi was also a graduate of the Informatics Engineering Department at the same Faculty as Tantri who graduated from the Faculty of Information and Communication Technology. According to Tri Rismaharini, who is familiarly called Mrs. Risma when conveying the message of the impression as a graduate guardian “The Information Systems Department is the very right department in the current era, why? Because in the current era, people are not only busy in carrying out their tasks but traffic conditions are jammed, making time more limited, therefore we need an application or system that can help in various lines of life for example by going to gojek, tokopedia, bukalapak, blibli etc. . Even every time I will make something or will do a system implementation there is always a consultant who will translate in coding language “. From my buying explanation (Mrs. Risma), it shows that in making something especially related to software applications she always involves consultants who will translate in coding where this ability is something taught in the Information Systems Department. 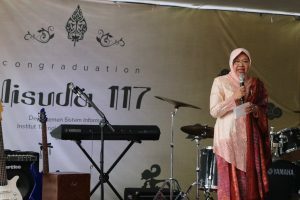 Furthermore, the Mayor of Surabaya also emphasized, “Indeed, in the digital era today students of Information Systems graduates are very much needed, so it is unfortunate if they do not have any opportunity because now is the era of the Department of Information Systems. When I do whatever approach I take in the city government, I always see the business process which consists of input output and processes, then there is integration / departure from the system, which is what the Information Systems students learn. Tandas is the first female mayor in Surabaya. Photo from left, Ir. Djoko Saptoadji, Tantri Gunarni S.Kom, Dr. (H.C.) Ir. Tri Rismaharini MT.